Develop a knack to stack! 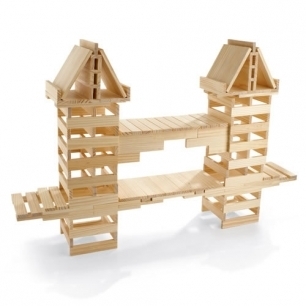 No glue or connectors required -- simply stack wood planks to create buildings, monuments, and geometric forms. It's the ideal activity to help children gain an understanding of balance and proportion, as well as interest in architecture, building, and design. Set includes: 200 pine planks and an idea booklet. Ages 7 and up. Sold by Gryphon House, Inc. Ships from Kaplan Early Learning Company.